I like food twists. You know, when something starts off regular sounding then ends with a switch-up. Things started off all normal and fine with the peanut butter, but I bet you weren’t expecting the curry part at the end, huh? But don’t go a worrying – these don’t taste like Indian take-out. You can just almost barely place the curry – it is more a hint of something that you can’t quite figure out, so you should probably have another one, and then oh man, where did the whole plate go type of thing. 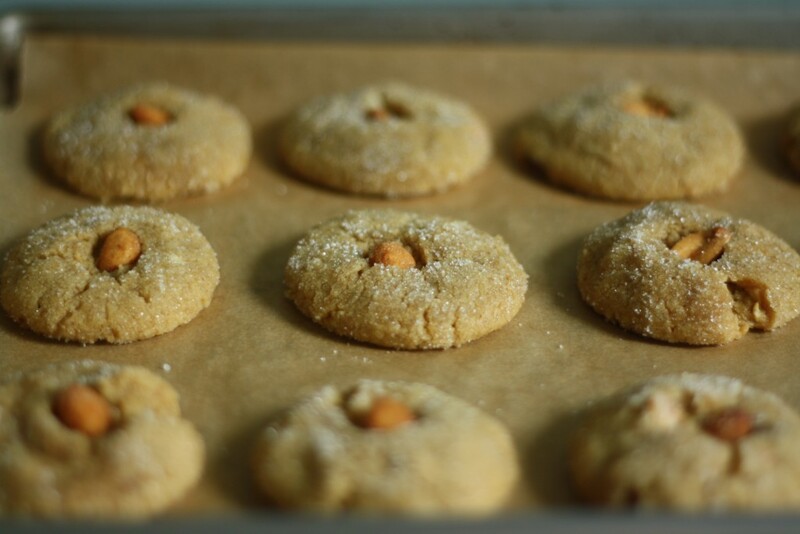 It is a nice easy way to update a classic, but if it sounds too scary these peanut butter cookies are excellent without. 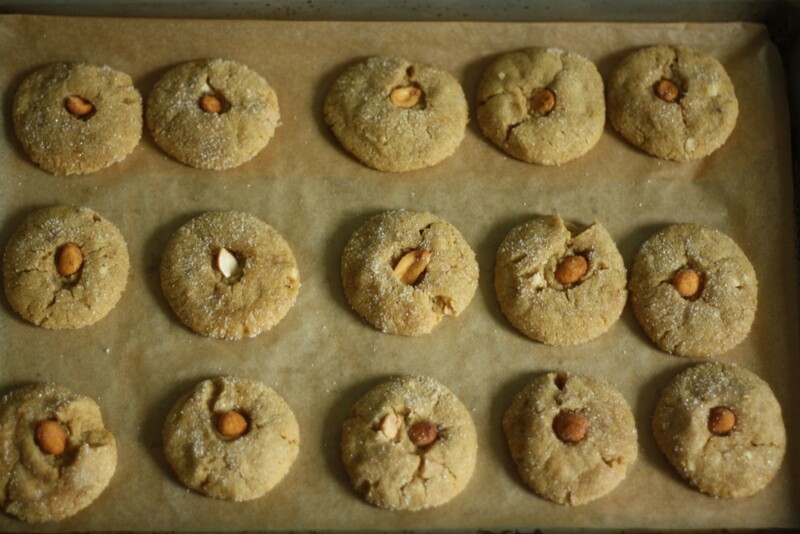 The extra sugar roll and peanut garnish is of course optional, but since these cookies have some warmth from the curry, it is nice to have a li’l extra bit of sweet crunch. Preheat the oven to 350 and line a baking sheet with parchment. Whisk together the flour, salt, baking soda, baking powder and curry in a medium bowl. In a larger bowl, beat the butter and sugars until light and fluffy. Add in the peanut butter and beat until completely incorporated. Then beat in the eggs, vanilla, and slowly add in the flour until it is fully combined. 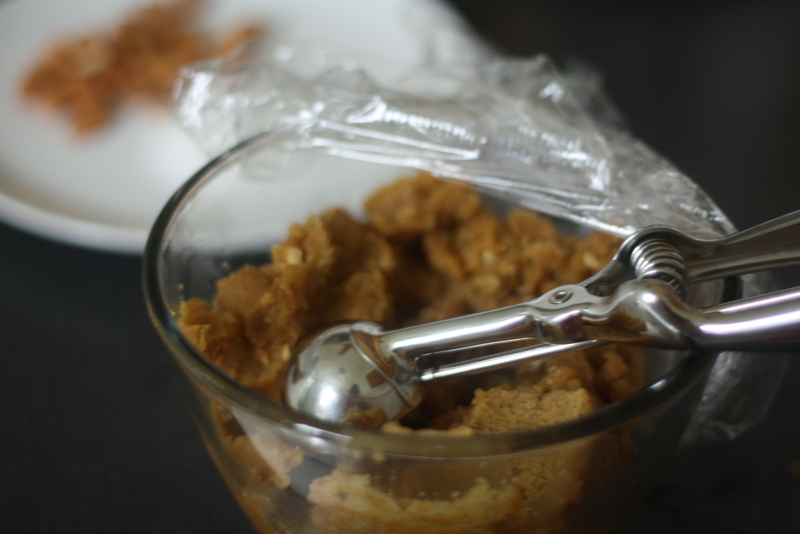 Using a scoop, measure out a ball of dough and release it into your hand. 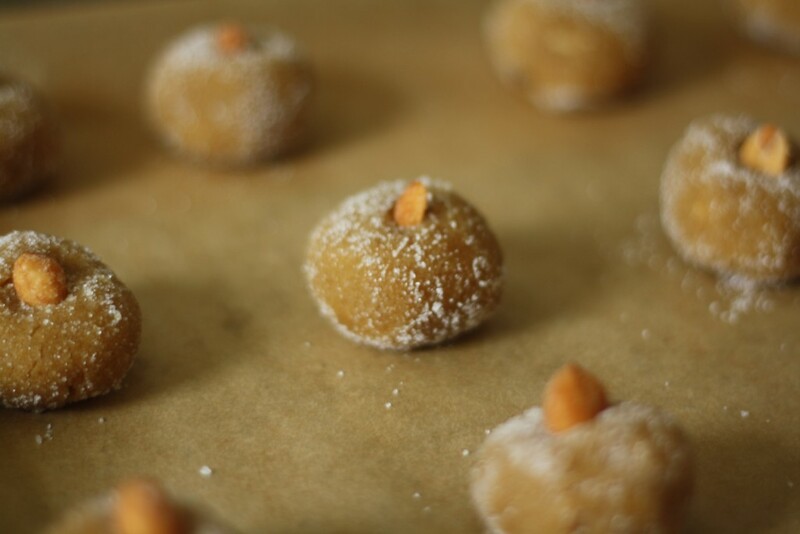 Shape it into a round ball, then roll in sugar and garnish with a peanut. Bake cookies for about 10 – 12 minutes, or until the centers are just beginning to puff and deflate. A slightly under baked cookie is better here than a burnt crisp of one. Cool on a rack. Yum! Just made these and they are delish! 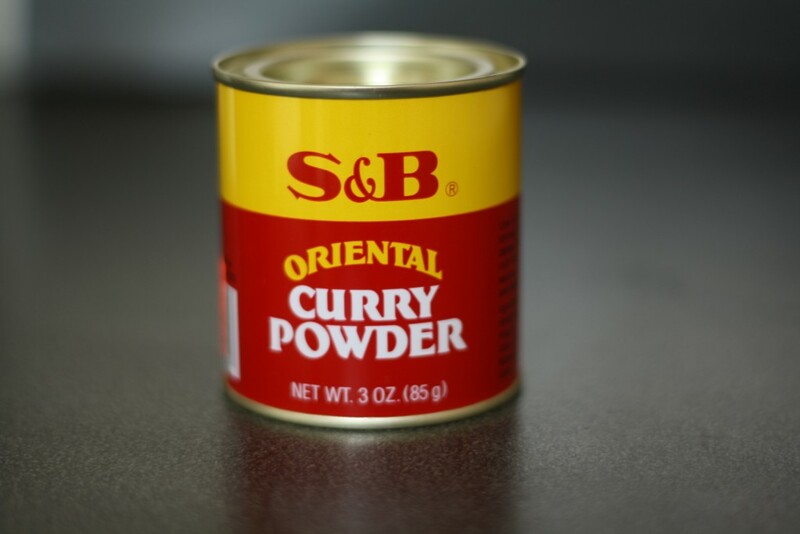 If anyone is worried about the flavor of the curry, your cant taste it very much. 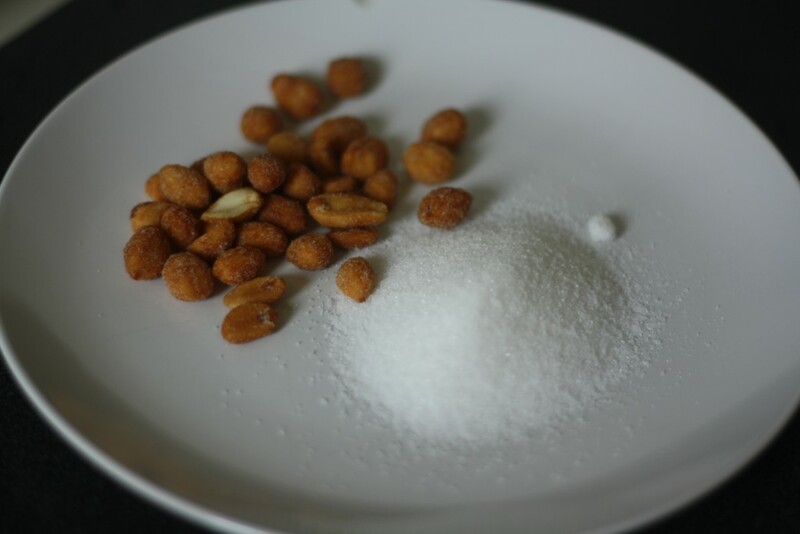 As said in the blog, it is a taste that keeps you guessing! Glad to hear they were enjoyed Sara!! Yay! Thank you and I’m so happy you found BMUB! Welcome to the land of butter and bourbon.